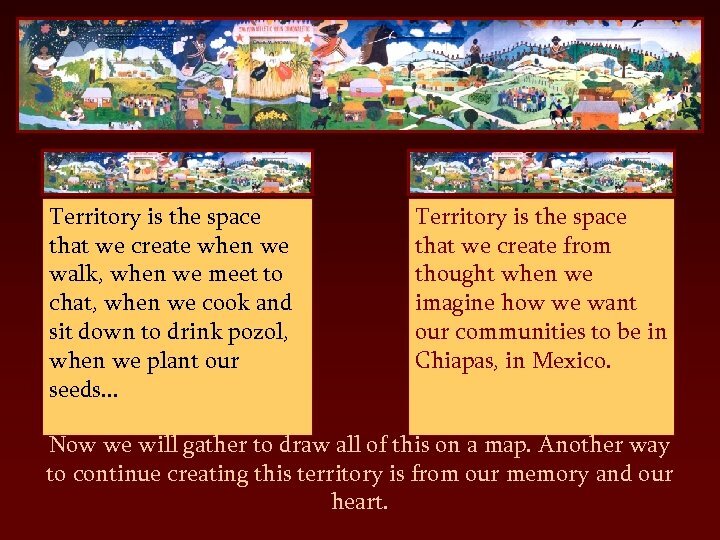 Territory is the space that we create when we walk, when we meet to chat, when we cook and sit down to drink pozol, when we plant our seeds. . . 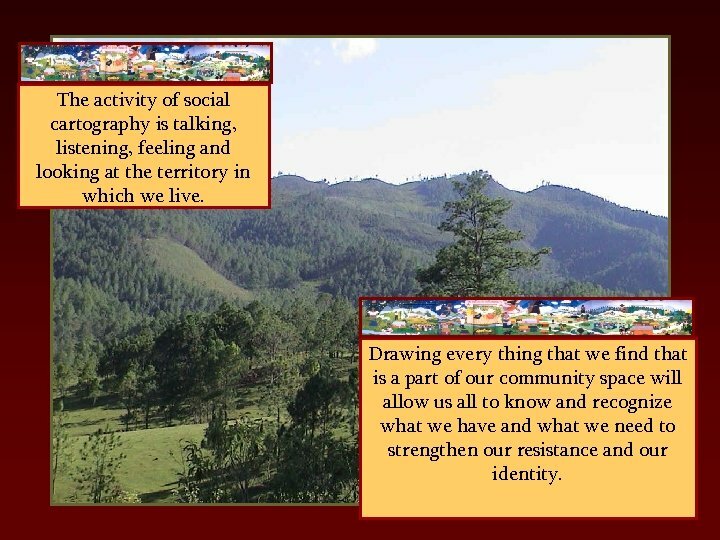 Territory is the space that we create from thought when we imagine how we want our communities to be in Chiapas, in Mexico. Now we will gather to draw all of this on a map. Another way to continue creating this territory is from our memory and our heart. 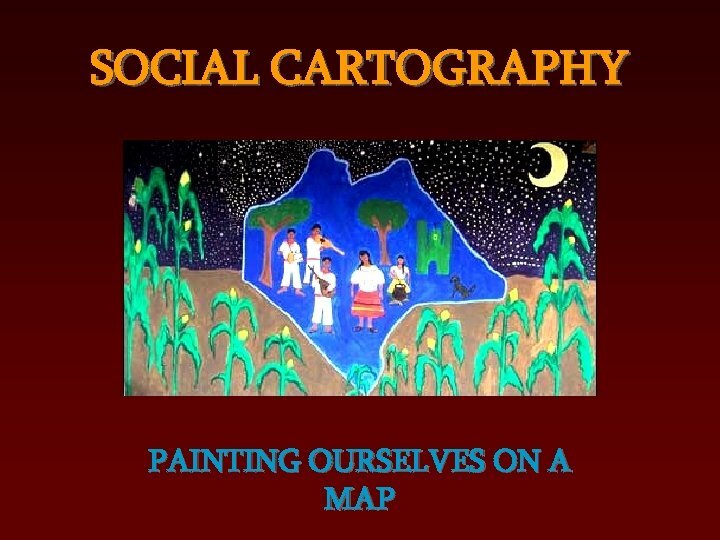 The activity of social cartography is talking, listening, feeling and looking at the territory in which we live. 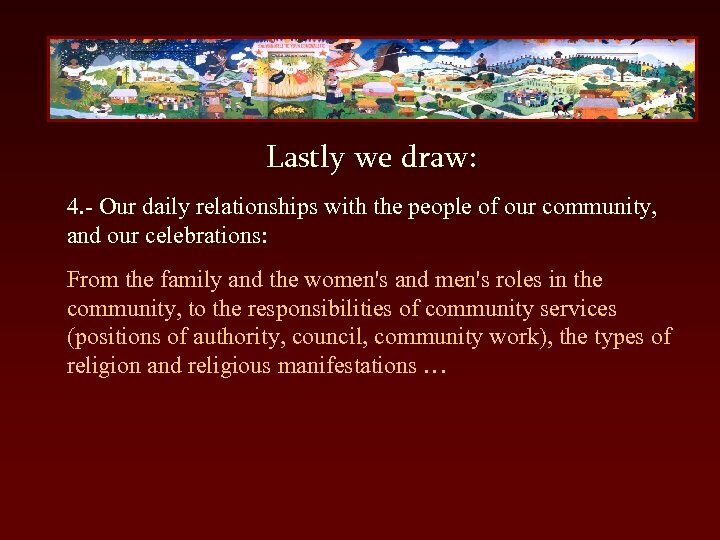 Drawing every thing that we find that is a part of our community space will allow us all to know and recognize what we have and what we need to strengthen our resistance and our identity. What we need. . . In this activity we will all speak and paint with our heart and our word. The first thing that we need is to GATHER TOGETHER. Because this is an activity in which we compliment each others knowledge and feelings by sharing about the territory that we inhabit. We also need a few materials: • Large white paper or cardboard or some kind of surface where we can paint • Four large sheets of plastic to put over the painting • Paints, markers, or colored pencils • Paintbrushes • We can also use other materials from our surroundings (leaves, dirt, . . . ). But since our word will not be placed on the map, two or three people will have to be in charge of writing down our word, they will be the “narrators”. 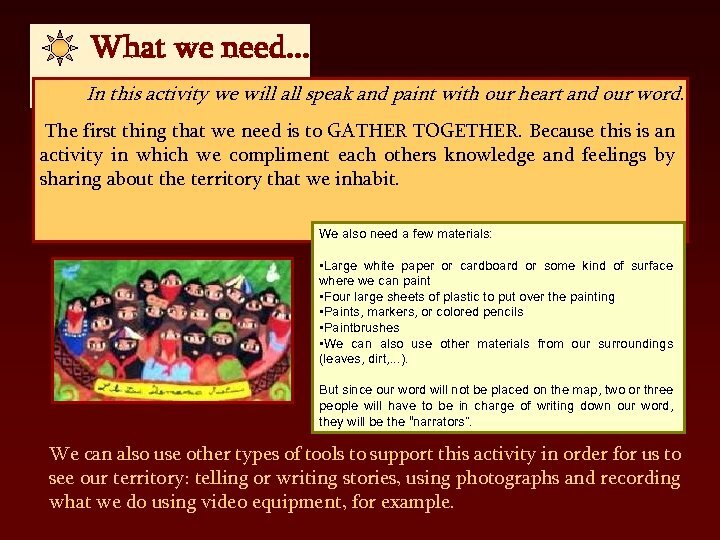 We can also use other types of tools to support this activity in order for us to see our territory: telling or writing stories, using photographs and recording what we do using video equipment, for example. 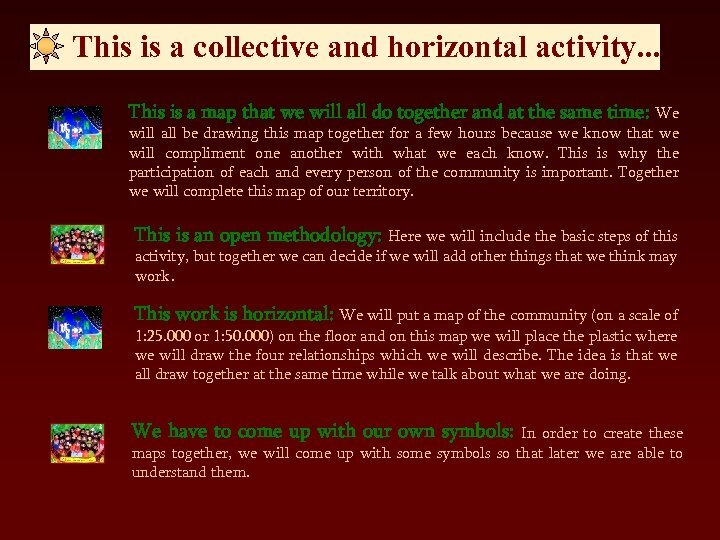 This is a collective and horizontal activity. . . 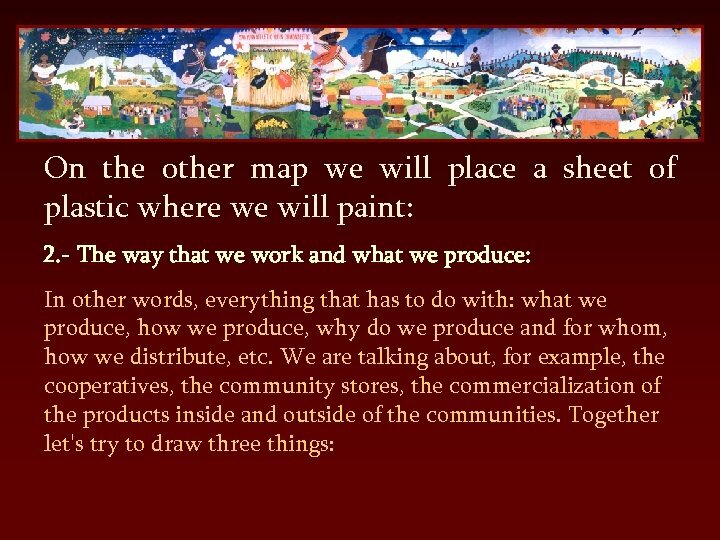 This is a map that we will all do together and at the same time: We will all be drawing this map together for a few hours because we know that we will compliment one another with what we each know. This is why the participation of each and every person of the community is important. Together we will complete this map of our territory. This is an open methodology: Here we will include the basic steps of this activity, but together we can decide if we will add other things that we think may work. This work is horizontal: We will put a map of the community (on a scale of 1: 25. 000 or 1: 50. 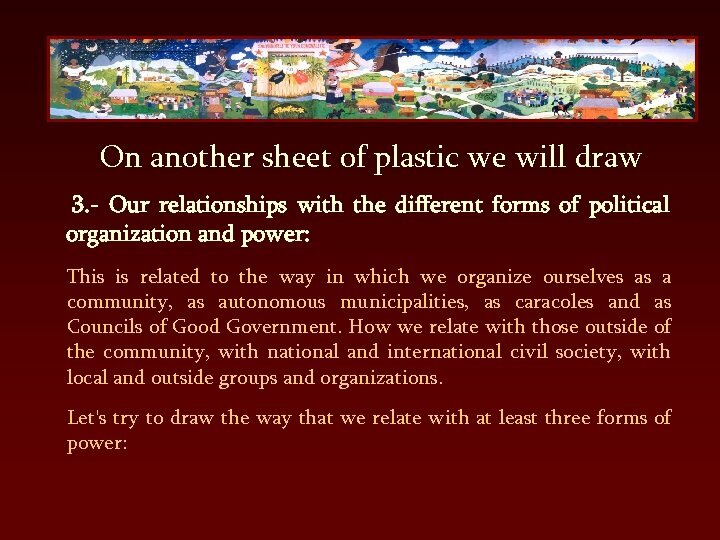 000) on the floor and on this map we will place the plastic where we will draw the four relationships which we will describe. The idea is that we all draw together at the same time while we talk about what we are doing. 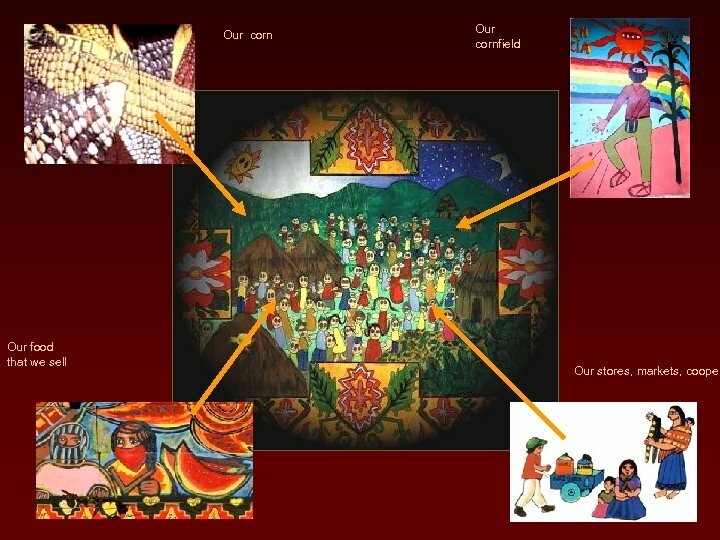 We have to come up with our own symbols: In order to create these maps together, we will come up with some symbols so that later we are able to understand them. How it is done. 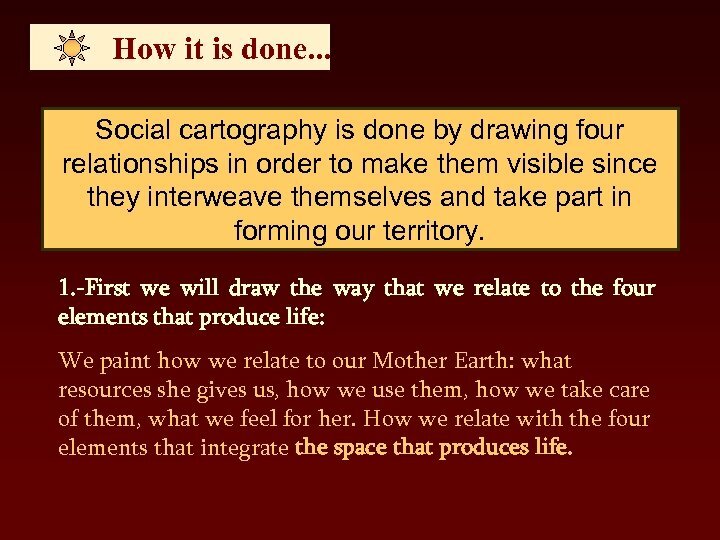 . . Social cartography is done by drawing four relationships in order to make them visible since they interweave themselves and take part in forming our territory. 1. -First we will draw the way that we relate to the four elements that produce life: We paint how we relate to our Mother Earth: what resources she gives us, how we use them, how we take care of them, what we feel for her. 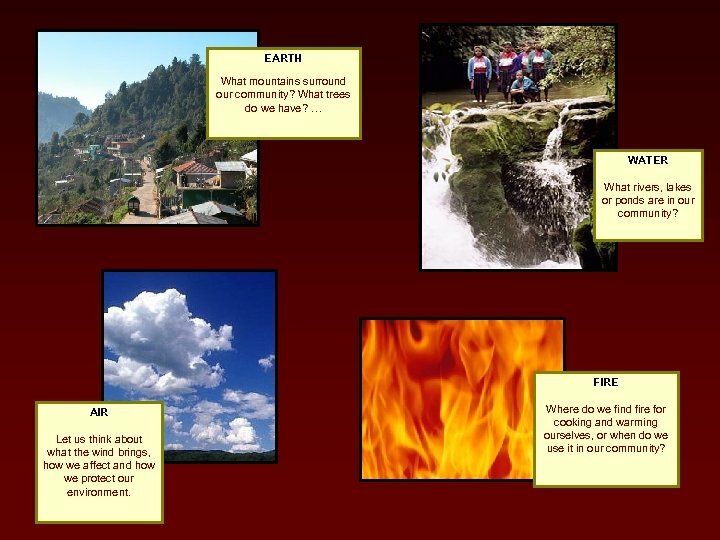 How we relate with the four elements that integrate the space that produces life. EARTH What mountains surround our community? What trees do we have? … WATER What rivers, lakes or ponds are in our community? FIRE AIR Let us think about what the wind brings, how we affect and how we protect our environment. 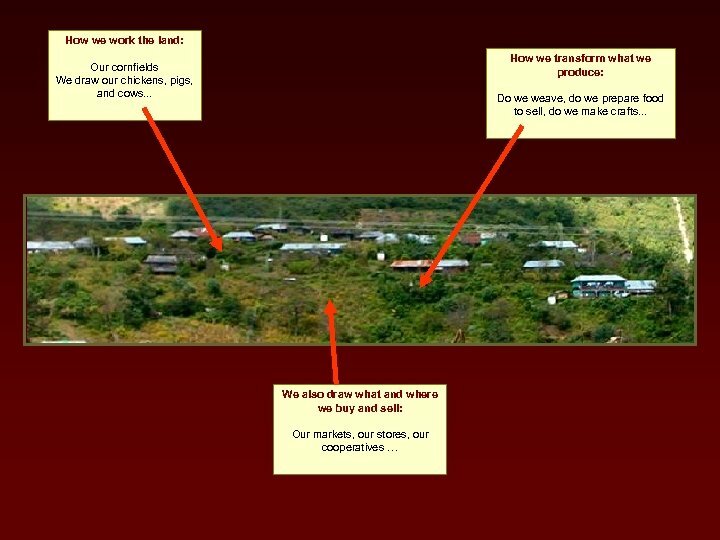 Where do we find fire for cooking and warming ourselves, or when do we use it in our community? 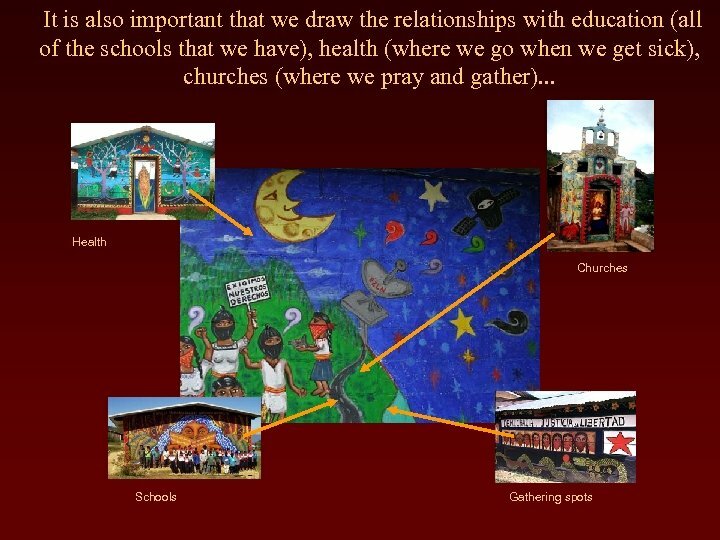 And in the same space we paint our houses and the services we have: telephone, electricity, water, sewage, gas … We will also write and draw what each of these elements mean to the community. 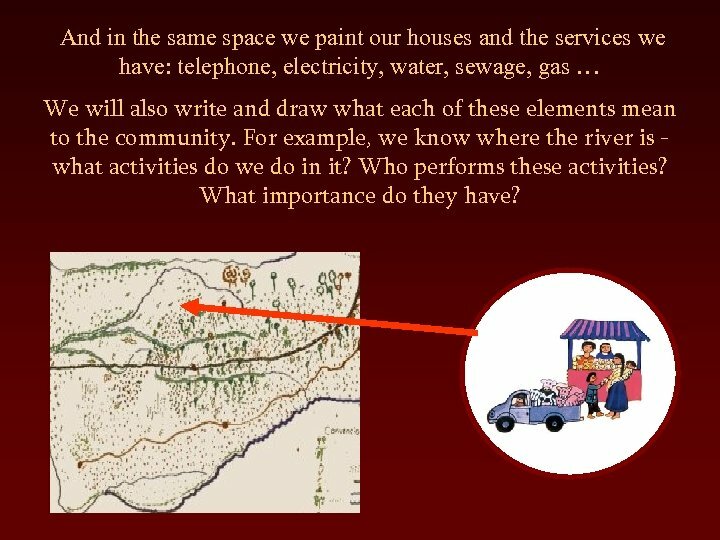 For example, we know where the river is - what activities do we do in it? Who performs these activities? What importance do they have? Let's paint the four maps in three moments. 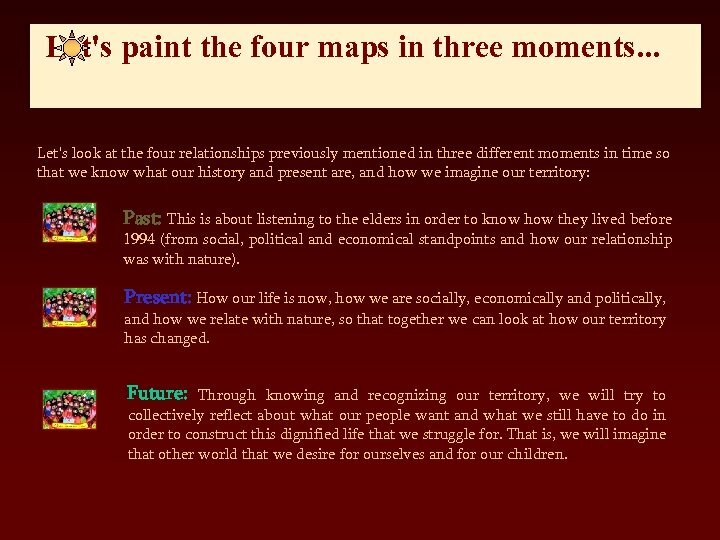 . . Let's look at the four relationships previously mentioned in three different moments in time so that we know what our history and present are, and how we imagine our territory: Past: This is about listening to the elders in order to know how they lived before 1994 (from social, political and economical standpoints and how our relationship was with nature). 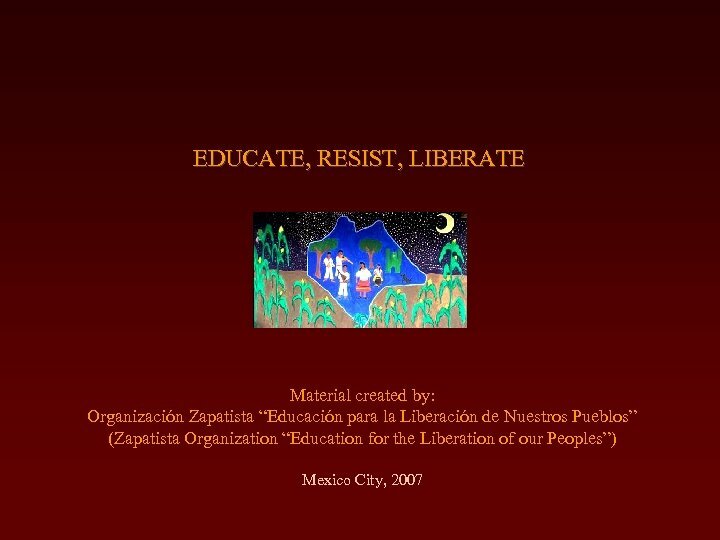 Present: How our life is now, how we are socially, economically and politically, and how we relate with nature, so that together we can look at how our territory has changed. 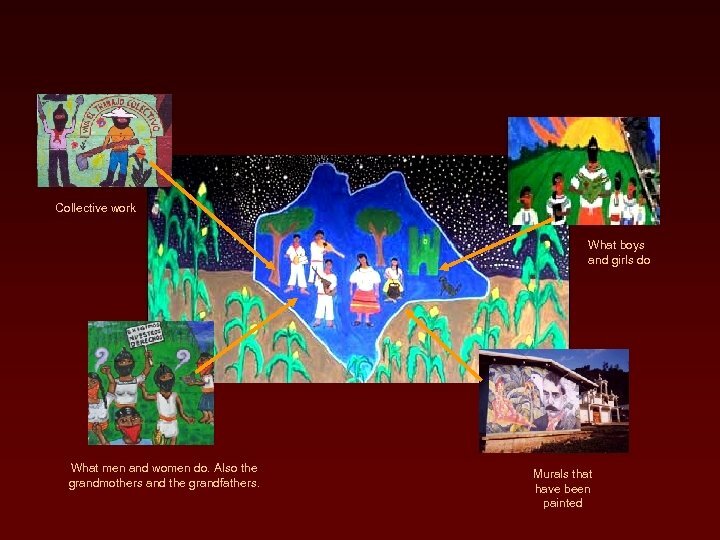 Future: Through knowing and recognizing our territory, we will try to collectively reflect about what our people want and what we still have to do in order to construct this dignified life that we struggle for. That is, we will imagine that other world that we desire for ourselves and for our children. For the end. . . At the end, we look at the maps all on top of each other and together we try to discover: What our strengths and weaknesses are. 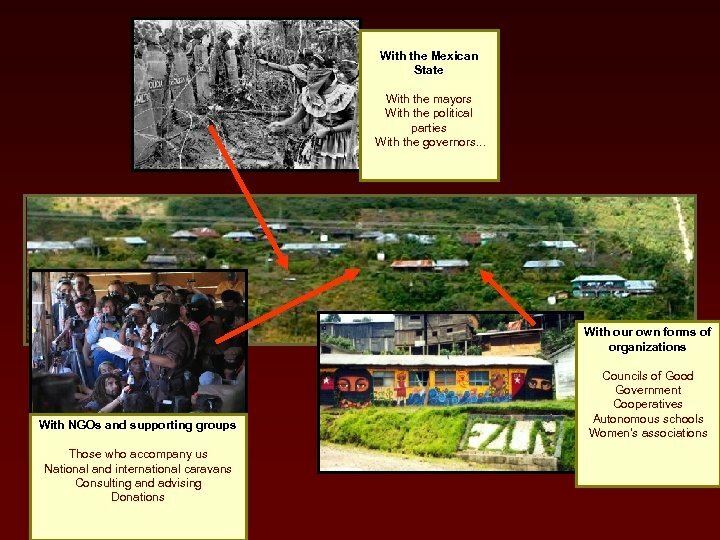 What we know and what we have neglected in our territory. How that which we discovered in one map affects the other maps. And other things that come to our minds. . . 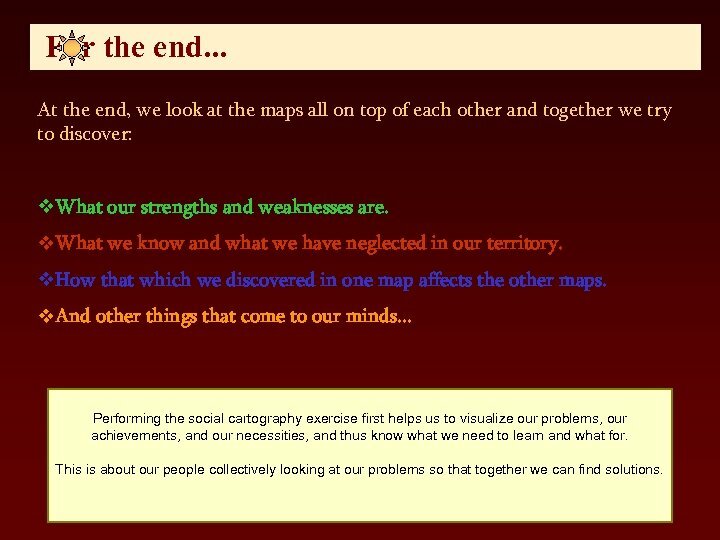 Performing the social cartography exercise first helps us to visualize our problems, our achievements, and our necessities, and thus know what we need to learn and what for. This is about our people collectively looking at our problems so that together we can find solutions.